Movies like Ferdinand are perfect for parent-teacher organization movie nights. Screening film adaptations of favorite books like Miss Peregrine’s Home for Peculiar Children during student entertainment assemblies. Student groups generating revenue through movie fundraisers. Before and after-school programs supplementing activities with movies. Showing short educational programs like “The Magic School Bus” during rainy day recess. Holiday parties featuring festive films. The Umbrella License makes motion picture copyright compliance easy because it is facility-based; it provides schools with affordable copyright protection whether teachers, before or after school administrators, or parent-teacher organizations show movies. Even if a school already holds a license covering most of the major Hollywood studios, it is important to be aware that multiple licenses are required to ensure broad motion picture copyright compliance and avoid the fines associated with copyright infringement. Just complete the online application or contact an MPLC Licensing Representative to secure an affordable annual license for unlimited exhibitions. For more information, visit our FAQ page or click to apply now! The Umbrella License from MPLC grants organizations permission to show legally obtained audiovisual programs without the need to report titles, dates or times of exhibition. Motion picture studios and producers represented under the Umbrella License vary according to the intended use and facility type. Civil penalties for unauthorized exhibitions start at $750 for each inadvertent infringement and go as high as $150,000 for each egregious violation. By comparison, an annual Umbrella License is a fraction of the cost and ensures copyright compliance for the entire school. For a complete list of motion picture studios and producers included in your Umbrella License for Schools and how to determine coverage, visit our coverage page. Copyrighted motion pictures and other audiovisual programs that are available for rental or purchase in any legal format, such as DVDs and other digital formats, whether streamed or downloaded, are intended for personal, private use only. 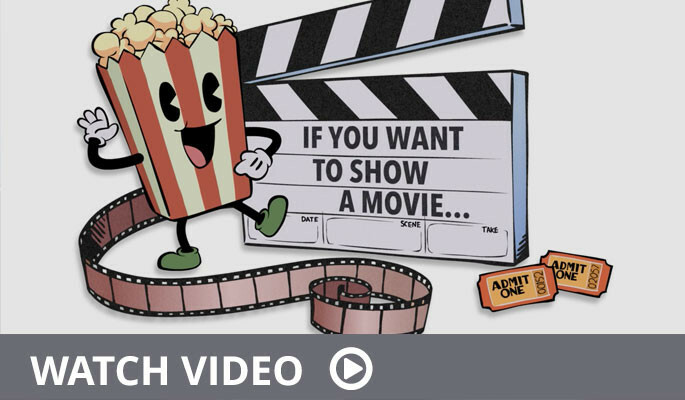 While nonprofit schools do not need a license to show videos for narrowly defined “face-to-face” instruction, i.e., when the movie is shown in the classroom and is part of the curriculum, all other school showings require a public performance license. This includes holiday parties, special events, before or afterschool programs, student assemblies or rewards, parent-teacher organization events and any entertainment use on campus. Some school officials are unaware that schools carry risk and may have vicarious or contributory liability simply by allowing unlicensed exhibitions to occur on campus. Civil penalties for unauthorized exhibitions start at $750 for each inadvertent infringement and go as high as $150,000 for each egregious violation. By comparison, an annual Umbrella License is a fraction of the cost and ensures copyright compliance for the entire school.